The Pew Research Center’s Project for Excellence in Journalism took a special look this week at the role of Twitter and other social media to find out in an expanded version of the weekly New Media Index. As is the case in many conflicts, the "fog of war" made verifying the quality and sources of information difficult last week. Alongside praises over Twitter’s role, some analysts downplayed the site as an organizing tool and there was speculation that tweets purportedly from protestors may have been part of a disinformation campaign. While the original source and location of Twitter links in this analysis is often unclear, the message of these tweets clearly reflects an online activism fostered by new technology. The conversation online, in both blogs posts and tweets, amplified a trend PEJ has noticed in social media. It is not just about expressing one’s opinion or even passing along information. It is also about getting actively involved. In the traditional press, the Iranian situation also led the agenda, though to a much lesser extent. About a quarter (28%) of last week’s newshole was devoted to the subject according to PEJ’s News Coverage Index. The other top stories were the economic crisis, debates over health care reform, concern over North Korea’s missile program and wide-ranging coverage about the Obama administration. For many in the mainstream press, Twitter became a symbol of a new kind of activism that can occur online. In the thousands of tweets analyzed about Iran last week, the emphasis shifted as the story evolved and the potential of social media became more apparent. Initially, most of the Twitter traffic included links about the events themselves, a few of which claimed to be from those witnessing events first-hand. 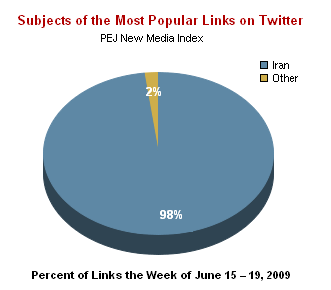 On Monday, June 15, the most linked-to page was a picture of thousands of protestors in Tehran accompanied by a number of Twitter-like comments. Among the supportive statements were ones such as "Its about time. Good luk iranian people. Long time coming"* and "Let their voices be heard! PEACEFULLY!" Other users linked to a CNN.com story about how Iranian activists were using Twitter as a tool for mobilization and for providing accounts of events as they were happening. Later in the week, the top tweeted stories focused more on how users could organize and take action online. On Tuesday, June 16, the most linked-to page was from a British blogger named Esko Reinikainen who published a "Cyberwar guide for beginners." Among his recommendations were ways that people could help bloggers who were posting from within Iran. "Do NOT publicise proxy IP’s over twitter," he advised along with "Help cover the bloggers: change your twitter settings so that your location is TEHRAN and your time zone is GMT +3.30." On Wednesday, June 17, one of the most linked-to pages was a blog post by Ben Parr at Mashable.com which described how the U.S. State Department had asked Twitter to refrain from performing maintenance on its servers so as to allow the flow of information coming to and from inside Iran. By the end of the week, many of the top news links from Twitter involved ways that individuals could use technology to its greatest advantage. By the morning of June 18, more than 30,000 tweets included links to a Web page helpiranelection.com which encouraged Twitter users to change the color of their avatar (a picture used online to represent one’s self) to green-the symbol of the protest movement. Many of those who linked to this page included the same message: "Show support for democracy in Iran add green overlay to your Twitter avatar with 1-click." Thousands of those who did change their avatars posted the tinted pictures on a site called Green Thumbnails. This page showed a mosaic of green images from people who had followed the site’s advice to "Support Change for Iran from your cubicle!" The site also linked to various other Web resources where one could find news and information about ongoing developments. Other popular pages included a Flickr page that scrolled through various images of the protests. "Powerful pictures from massive Iranian Protests after #IranElectiion," tweeted Ejaz Asi in response to the collection. "RT Wondering where the truth lies? These images will help. (BTW new pics all the time)," added Gwog. Also popular was a Web survey called "Where is My Vote?" which encouraged Google to change its logo for a day in order to help the people of Iran. While it did not change its logo, Google, along with the social networking site Facebook, announced ways they would incorporate the Persian language into their capabilities, facilitating communication from within Iran. "Kudos to Google for ramping up Persian translation services," responded johnobclayton. Most of the attention in the blogosphere last week expressed support for those participating in the protests against the Iranian government and for the role of social media. Many bloggers were inspired by a June 15 pictorial on the Web site of the Boston Globe that showed images of protestors immediately following the disputed election. "I am still sort of in shock," wrote Tony Hunt. "I have faith in all those courageous people risking their lives so much just to speak their mind…It is this strength & character that people of lesser conviction seek to destroy and diminish in order to retain what they perceive to control." "As we have focused our attention on Iran in the aftermath of their ‘election,’ it is natural to want to do something to help," declared VJack at Atheist Revolution. "I think that the single most effective thing we can now do is simply keep talking and writing about Iran…The more attention Iran receives, the better the situation will be for the Iranian people." A significant portion of the comments emphasized the role that social media was playing, particularly in reaction to a June 15 New York Times story on that subject. "Since [author Howard] Rheingold wrote of Smart Mobs, activists have been atwitter about the potential of mobile phones and texting to effect democratic change," noted Rohan Samarajiva at Lirneasia.com. "The ongoing struggle against the theocratic dictatorship in Iran has given many examples. But it also shows the limits." "There are two uprisings right now related to Iran," described Daryl Lang at PDNpulse. 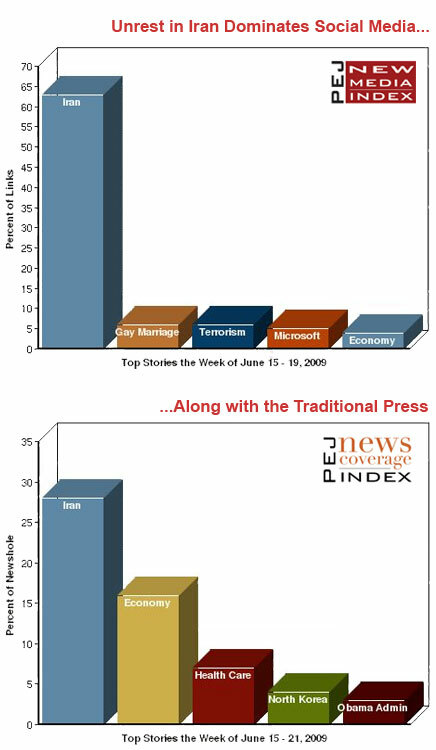 "The most important one is visible in the massive street demonstrations ….A lesser, but still important, uprising concerns dissatisfaction with news coverage…The general sentiment is that the mainstream media was too slow and too cautious in covering the Iran election…Many Twitter commentators are relying on photos from Tehran for facts about what’s going on." While not the dominant focus of the discussion, some bloggers were critical of President Obama’s restrained response to the crisis, a debate that was also taking place in Washington. "I’m not asking my President to send in the Marines or anything," avowed Rob at Say Anything Blog. "But I do expect the leader of the free world to take the lead in condemning acts of thuggery such as those being perpetrated by the theocratic government in Iran on its subjects. Words mean things. The Presidential bully pulpit is a powerful thing." YouTube was another avenue through which to disseminate information about events in Iran last week. The two most viewed news videos on YouTube contained eyewitness footage of the protests in the streets of Tehran, although, as many media outlets who relied on such amateur video noted, it was impossible to independently confirm their accuracy. 1. A video of protestors that is described as a "riot in the streets in Tehran after election day."